The competition between cryptocurrencies is heating up, as the world is getting more and more curious about the advantages provided by this innovation. Bitcoin might be headed for the stars, but the other digital coins are not going to willingly fall behind. Look at Litecoin’s example and you will understand what we are talking about. 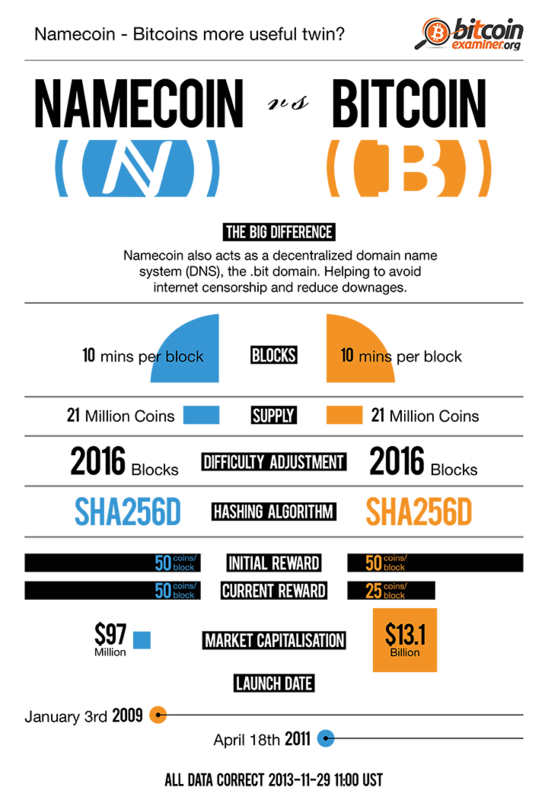 For now, we will stick to the polyvalent Namecoin, taking a few moments and a nice infographic to compare it with Bitcoin. You will find some differences, but mainly affinities between these two digital currencies. But stay tuned because we have a lot more infographics for you! All Things Luxury just recently announced that they will accept namecoin as a form of payment. The first big surge in Litecoin was partly accredited to All Things Luxury accepting it. Good news for Namecoin! I like Mincoin, Primecoin. Litecoin and esp. Devcoin and I hope many of them get traction. Good luck to the cryptocurrencies!